Kelly Dries, executive director of the Office of Career and Professional Development, notes that her group now hosts a drop-in studio workshop that all students surveyed would recommend to a friend. Kelly Dries recently joined the University of Redlands as executive director of the Office of Career and Professional Development from the University of Utah. 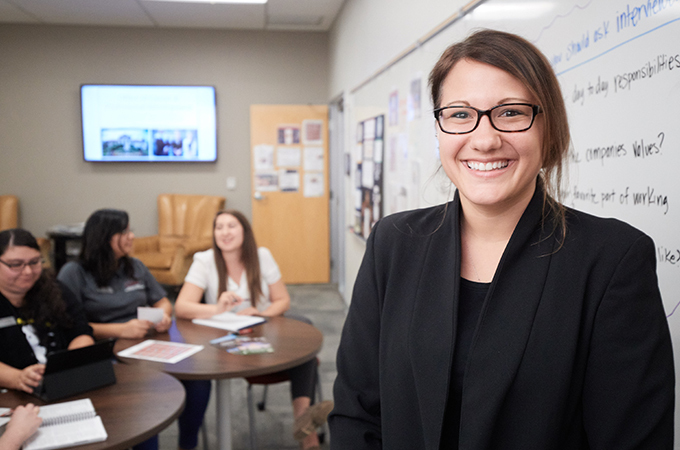 She sat down with U of R’s Mika Elizabeth Ono and Katie Olson to discuss the recent changes in the career development group, the office’s goals and priorities, and how she sees the world of work evolving. Bulldog Blog: What has happened in the Office of Career and Professional Development since you arrived at the U of R in August, and where is it heading? Kelly Dries: One of the first things we did last fall was to relocate to a beautiful new space in Armacost Library, room 116. We have been trying to increase awareness of the career center and the importance of career education in general. To do this, we hosted two open houses, one for students and the other for faculty, staff, and trustees. These provided a great opportunity for us to share what we’re doing and generate some excitement around our initiatives. I also had more than 160 one-on-one meetings with staff, faculty, alumni, employers, and trustees to help me understand the landscape of career education on campus and how we can elevate that in partnership with key individuals and existing programs. BB: What did you find about the career education ecosystem at the U of R? KD: A lot of what I found led to our current priorities. One of those is empowering connections among Bulldogs. Alumni want to give back; giving a keynote address or mentoring students one-on-one can be part of that. It’s a goal to build a more effective platform to facilitate connections between students and alumni and among fellow alumni. Right now, one section of our website has options for alumni or employers to let us know they want to get engaged. Also, if alumni want to host an intern, we can let students know. Building the capacity of our office is another priority. Previously, the three full-time staff members were busy with one-on-one appointments with students. We changed how we operate to better scale our services and now offer a drop-in studio workshop, a trend among career centers. Our student workers—both graduate students from the School of Education and undergraduates—offer their peers content, such as how to put together résumés and cover letters. We’ve found students are less intimidated to come in, and the center is more accessible and convenient. In fact, 100 percent of students who visited the studio and responded to our survey said they’d recommend it to a friend. This arrangement has freed up time for staff members to do other things, such as building relationships with alumni and employers. BB: What are some of the tools currently available to students and alumni? BB: What else should alumni who are already in the workforce know about the Office of Career and Professional Development? KD: The office isn’t just for students, and we do more than résumés! We have resources and can help support career transitions or career accelerations. We can help people figure out how to make connections, build a network, strengthen a personal brand, and negotiate for salary and/or benefits. We are here for Bulldogs, regardless of where they are in the career development or career readiness process. BB: Do you have advice for parents of college-age students? KD: Talk to students about the career center and encourage them to visit early, even if they truly have no idea what they might want to do. The first year of college is the perfect time to come in. We can help lay out a plan to explore—finding alumni on LinkedIn; reaching out for informational interviews; and, if it’s something they want to pursue further, applying for internships. An important piece is what students value in a job, what work means to them, and what they want to get from it. If they come in senior year, it's almost time to get a job, and that’s a different conversation. BB: How do you see the world of work evolving? KD: The world of work changes every day. I advise everyone to be adaptable because fields are shifting, and new jobs are being created. What stays constant, however, is the top skills employers want. According to a list published annually by the National Association of Colleges and Employers, employers are looking for the ability to communicate well verbally and in writing, initiative, leadership skills, collaboration, and teamwork. What Redlands can provide with a foundation in the liberal arts is powerful. Our office helps students and alumni articulate that to employers in a persuasive way. BB: How did you get interested in career education? KD: Most people who work in career services fell into it. That’s true in a lot of careers. In the career center, we have “career chaos theory”—basically planned happenstance. It’s finding ways to create connections, to say “yes” to opportunities, and eventually finding your way. I’ve stayed in career education because I was a student who never visited the career center, and I was a master’s degree student who changed her major—which you really shouldn’t do. I started out as a seventh-grade English teacher, ended up in health care, and then decided to go back to school. After a graduate assistantship in the student affairs division, I knew I wanted to work in higher education. Starting in the career center was a twist of fate, and I’ve stayed because of the visible impact of the work that we do. We help people pursue their dreams. BB: How are you liking Redlands? KD: One question on my listening tour was “What is the ‘x factor’ of the Redlands graduate?” I wanted to know because I talk with employers about why they should be recruiting here. Many of the answers reflect what attracted me to the school in the first place—the small class size and the kinds of relationships students have with faculty. That’s a great experience for students, but it also gives them skills since they’re interacting with faculty and getting more exposure to specific fields of interest because of that. I appreciate the family feel at the University. After Thanksgiving, I got ill, and my partner wasn’t here yet. I’d been in Redlands three months. I was new to the University and the state of California. I hardly knew anyone. A colleague found out I was sick, and she brought me bread, soup, saltines, Gatorade, and ginger ale. That kind of community is what makes Redlands special. Learn more about the U of R Office of Career and Professional Development, which will be hosting its first Career Conference for U of R students on Saturday, February 23.